Blood clotting or coagulation is a biological process that stops bleeding. It's vital that blood clots when we have a surface injury that breaks blood vessels. Clotting can prevent us from bleeding to death and protect us from the entry of bacteria and viruses. Clots also form inside our body when a blood vessel is injured. Here they prevent blood loss from the circulatory system. Our body can both make clots and break them down once they've done their job. In most people, a healthy balance is maintained between these two activities. In some people abnormal blood coagulation occurs, however, and their body may not be able to break clots down. A large clot inside a blood vessel is potentially dangerous because it can block blood flow in the vessel. Internal clots that form without an obvious injury or ones that travel through blood vessels are also dangerous. Coagulation of blood is a fascinating and complex process that involves many steps. Proteins made by the liver and sent into the bloodstream are an essential part of the process. The proteins circulate around the body in our blood, ready for action at any time. An external or internal injury is the trigger that activates the proteins and sets the blood clotting process in motion. 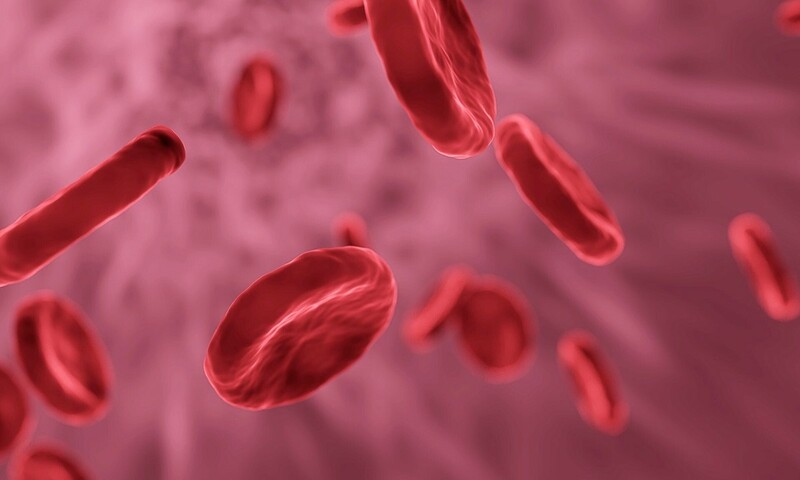 Red blood cells (or erythrocytes) carry oxygen to cells. The five types of white blood cells (leukocytes) fight infections in various ways. Platelets (thrombocytes) play an essential role in the blood clotting process. They develop a spiky appearance when they're activated. Hemostasis is the process in which bleeding is stopped. It involves three steps. Vasoconstriction: narrowing of damaged blood vessels to reduce blood loss. 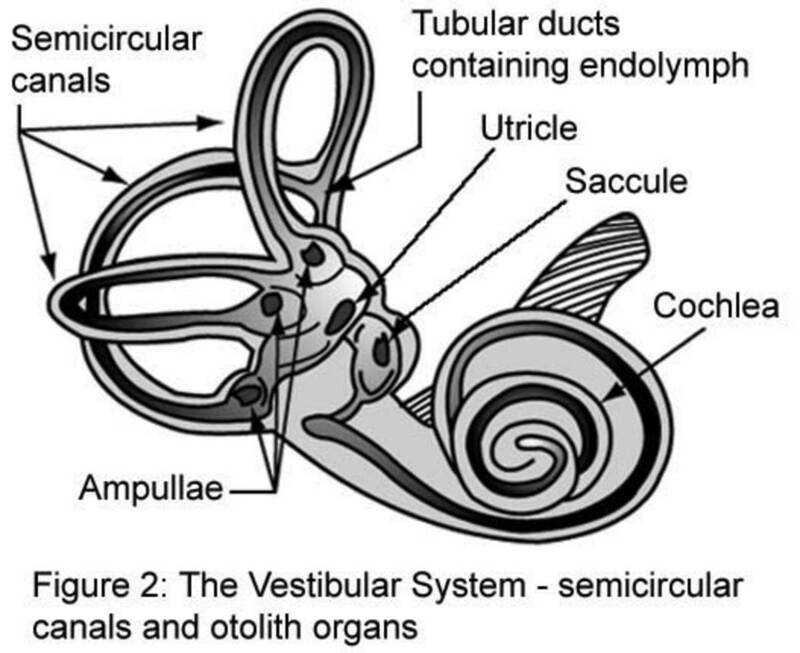 This is caused by contraction of the smooth muscle in the wall of vessels. Activation of platelets: activated platelets stick to each other and to collagen fibres in the broken walls of blood vessels, forming a platelet plug that temporarily blocks blood flow. The platelets also release chemicals that attract other platelets and stimulate further vasoconstriction. Formation of a blood clot: the clot contains fibres that trap the platelets and is stronger and longer-lasting than the platelet plug. Platelets are small cell fragments in our blood. They have a somewhat irregular form but are roughly disk shaped. 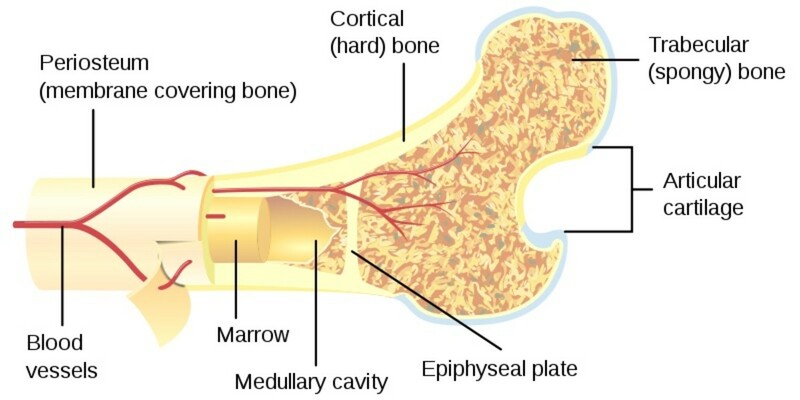 They are produced by budding off from a larger cell in bone marrow called a megakaryocyte. 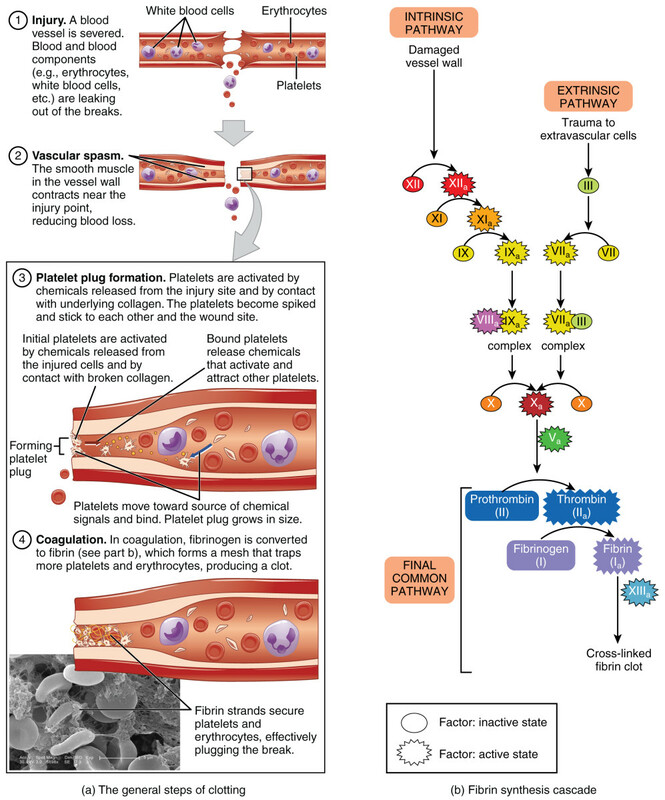 Platelets play an important role in the initiation of a blood clot. The first step in healing a wound is the activation of platelets. When platelets touch the damaged wall of a blood vessel, encounter turbulence in blood flowing around a wound, or encounter specific chemicals in the blood, they become "sticky". They bind to the injured cells in a wound as well as to each other. During this activation process, the platelets become more rounded in shape and develop spikes. Activated platelets form a mesh, or a platelet plug, that covers and fills a wound. The plug temporarily stops bleeding and is a very helpful emergency response to a wound. It's quite weak, however, and may be removed by flowing blood unless it's strengthened by a blood clot. The activated platelets in a plug release chemicals that are needed by the blood clotting process. The blood clotting process is complex and involves many reactions. However, the process can be summarized in three steps. A complex known as a prothrombin activator is produced by a long sequence of chemical reactions. The prothrombin activator converts a blood protein called prothrombin into another protein called thrombin. 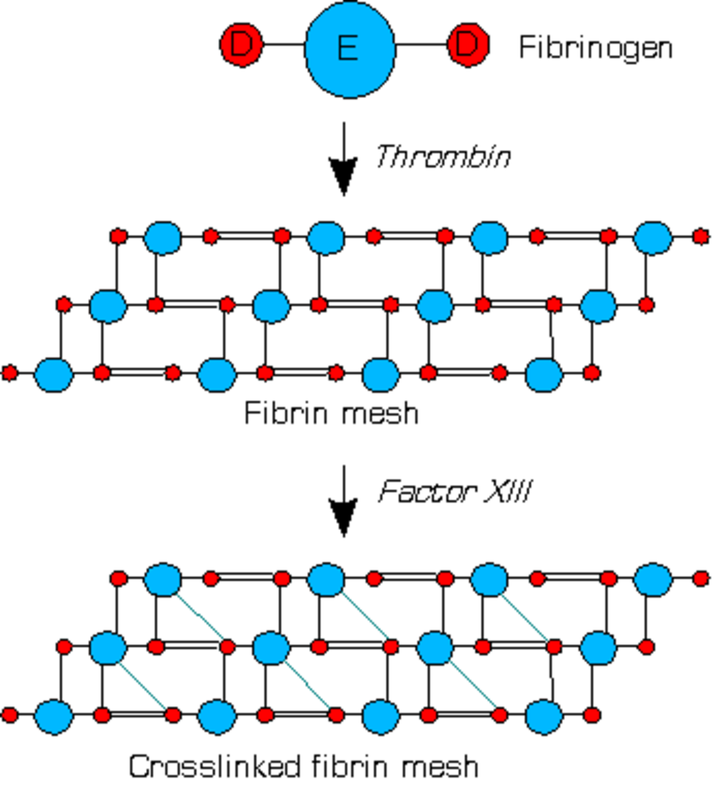 Thrombin converts a soluble blood protein called fibrinogen into an insoluble protein called fibrin. Fibrin exists as solid fibres which form a tight mesh over the wound. The mesh traps platelets and other blood cells and forms the blood clot. Prothrombin and fibrinogen are always present in our blood, but they aren't activated until a prothrombin activator is made when we're injured. Blood clotting occurs in a multi-step process known as the coagulation cascade. 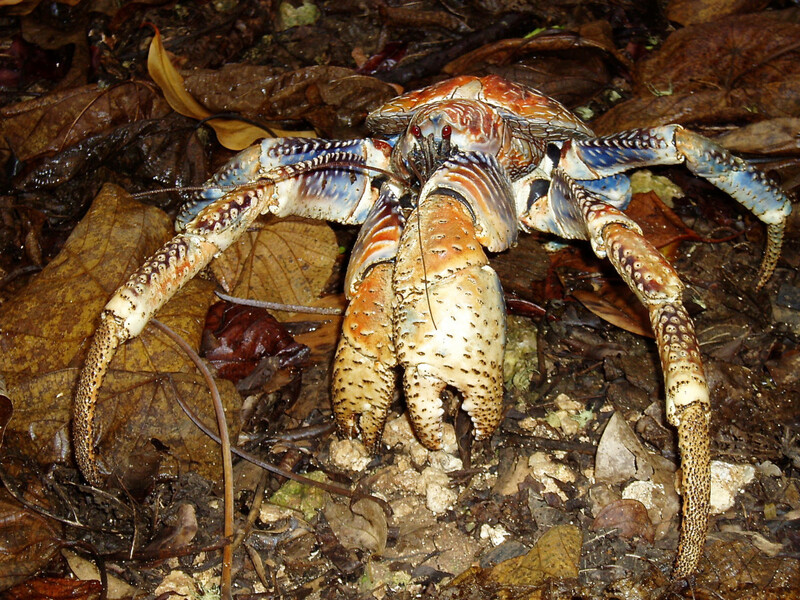 The process involves many different proteins. The cascade is a chain reaction in which one step leads to the next. In general, each step produces a new protein which acts as an enzyme, or catalyst, for the next step. The coagulation cascade is often classified into three pathways—the extrinsic pathway, the intrinsic pathway, and the common pathway. The extrinsic pathway is triggered by a chemical called tissue factor that is released by damaged cells. This pathway is "extrinsic" because it's initiated by a factor outside the blood vessels. It's also known as the tissue factor pathway. The intrinsic pathway is triggered by blood coming into contact with collagen fibers in the broken wall of a blood vessel. It's "intrinsic" because it's initiated by a factor inside the blood vessel. It's sometimes called the contact activation pathway. Both pathways eventually produce a prothrombin activator. 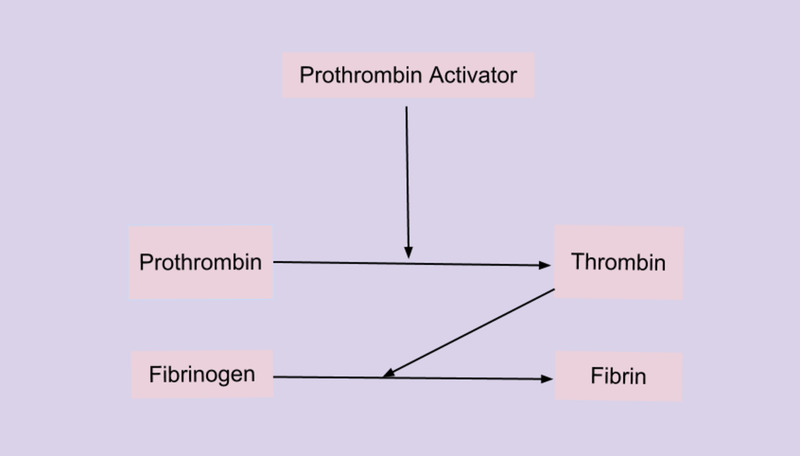 The prothrombin activator triggers the common pathway in which prothrombin becomes thrombin followed by the conversion of fibrinogen to fibrin. Although dividing the coagulation process into extrinsic and intrinsic pathways is a useful approach to the topic and is a widely used tactic, scientists say that it's not completely accurate. For many students of this complex process, however, it's the best solution for understanding blood clotting. 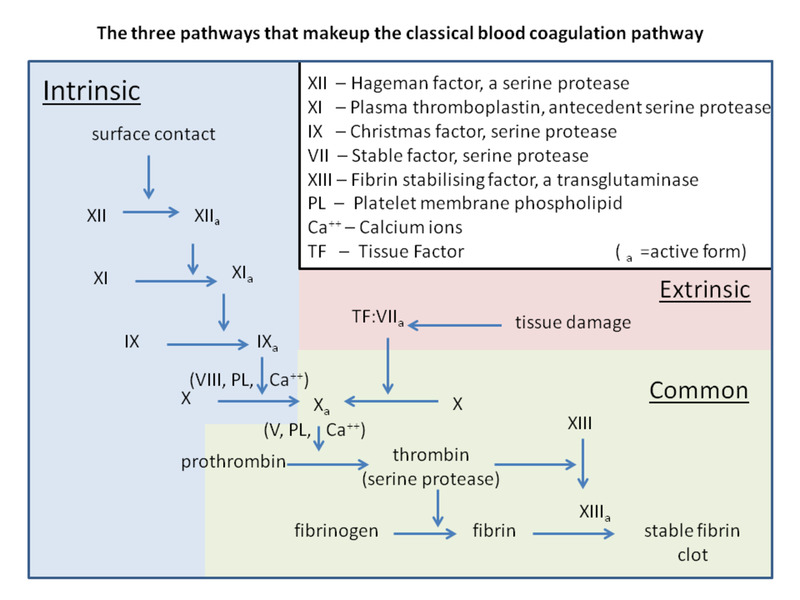 The Roman numerals in a coagulation cascade diagram represent clotting or coagulation factors. These factors are chemicals that are required in the chain of reactions that make up the blood clotting process. The chemicals involved in the coagulation cascade are called clotting or coagulation factors. There are twelve clotting factors, which are numbered with Roman numerals and given a common name as well. The factors are numbered according to the order in which they were discovered and not according to the order in which they react. Other chemicals are needed for blood clotting in addition to those numbered in the coagulation cascade. For example, vitamin K is an essential chemical in the blood clotting process. Damaged tissue cells release tissue thromboplastin. Platelets release platelet thromboplastin. The Factor Vl name is no longer assigned after it was discovered that the chemical that was given the name was actually activated Factor V. The name is traditionally retained in a table of coagulation factors, however. At the high school level the discussion of blood clotting often begins with the prothombin activator and the previous steps before its formation are ignored or summarized very briefly. At the college or university level a more detailed knowledge of the process may be needed. Students sometimes find that studying the coagulation cascade is a challenge, especially when reactions in the cascade must be memorized. Videos from a reliable source can be helpful because they show the blood clotting process visually and can be paused and replayed as necessary. It may be useful to make notes based on a video and then ask an instructor for clarification if necessary. Making frequent diagrams of the cascade can also help a student to memorize the reactions. Sometimes different sources present slightly different versions of the coagulation cascade. This is due to our lack of precise knowledge of some of the steps or the fact that a version hasn't been updated with the latest discoveries. If you're studying blood clotting at an educational institution, the version of coagulation that your instructor gives you will be the "official" version. Though the ability to coagulate blood is essential, it can be dangerous if it occurs inappropriately. The body has ways to prevent this from happening. The endothelium is the layer of cells that lines the inside of a blood vessel wall. The smooth surface of the endothelium discourages clot formation when there is no injury. In addition, there is no exposed collagen inside a blood vessel. Collagen is a fibrous protein that provides strength to tissues. When blood contacts collagen the clotting process is stimulated. Another factor that prevents unwanted clots from forming is the fact that the clotting proteins in the blood are present in an inactive form. They only become active when the body is wounded. A chemical called Protein C acts as an anticoagulant by inactivating two of the activated coagulation factors (Factor Va and Factor Vllla). Protein S helps Protein C do its job. The two proteins are very useful for preventing blood clotting. When a blood clot has served its function and the tissue underneath it has been repaired, the clot needs to be removed. In addition, it's important that any clots inside a blood vessel don't become large enough to block the vessel. Fortunately, the body is able to deal with these problems. Fibrinolysis is the process in which fibrin is destroyed by an enzyme called plasmin. Plasmin cuts the fibrin threads up into smaller pieces, which can then be further broken up by other enzymes and removed from the body in the urine. A healthy body protects us by clotting blood when we're injured, removing clots when they're no longer needed, and preventing clots from growing too big. The normal blood clotting process is certainly complicated, but it's also amazing. Learning more about the process may help researchers discover ways to improve coagulation as well as prevent it from occurring inappropriately. What is the name of the mosquito's anticoagulant, and how does it work? Mosquitoes in the subfamily Anophelinae have a peptide called anophelin in their saliva. (The mosquitoes that transmit the malaria parasite belong to this subfamily.) Anophelin inhibits thrombin, preventing blood coagulation. Mosquitoes in the subfamily Culicinae have an anticoagulant in their saliva that inhibits the coagulation or clotting factor known as FXa. It’s referred to as an “FXa-directed anticoagulant”. The saliva of mosquitoes isn’t well characterized. It may contain additional chemicals that affect blood clotting and make obtaining the liquid more efficient. Only female mosquitoes feed on the liquid. They need blood proteins in order to make their eggs. What are the two targets of positive feedback from the common pathway in blood clotting? There are multiple positive feedback reactions involved in coagulation. For example, once thrombin is formed in the common pathway, it stimulates the activation of platelets. It also activates more Factor V and Factor Vlll. Do white blood cells take part in blood clotting? No, white blood cells (or leukocytes) aren’t involved in blood clotting. Instead, they help to protect the body from infection and disease. There are five major types of leukocytes, each with their own characteristics. 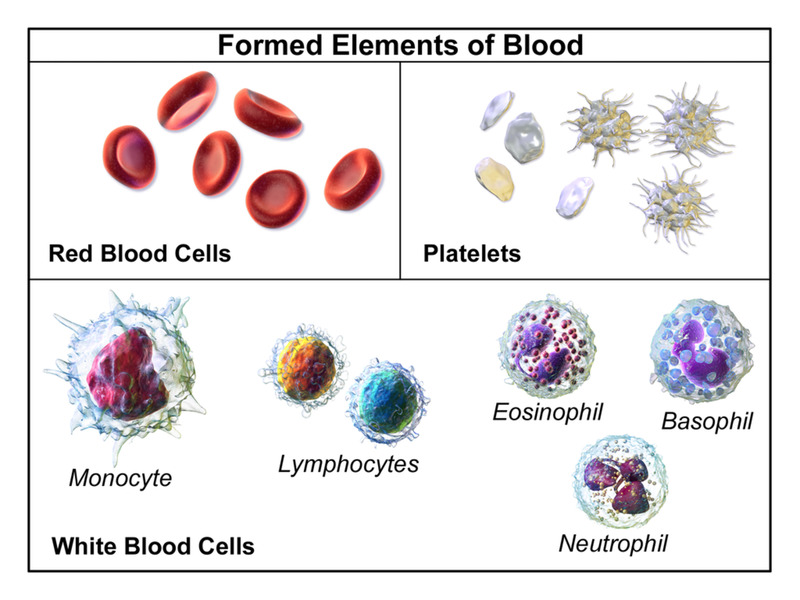 In order of abundance in our body, these types are neutrophils, lymphocytes, monocytes, eosinophils, and basophils. Multiple types of lymphocytes exist. White blood cells protect us by a variety of methods. For example, some surround and ingest invading microbes or cellular debris. Others produce proteins called antibodies. Some release other helpful chemicals or activate other leukocytes. The cells play a vital role in our body, even though they don't help blood to clot. Are prothrombin and fibrinogen types of white blood cells? No, prothrombin and fibrinogen are proteins, not cells. More specifically, they are glycoproteins—proteins with attached carbohydrate. They are both found in blood plasma. What is the final substance of a blood clot? A blood clot consists of a mesh of fibrin threads, clumped platelets, and trapped red blood cells. Fibrin is a protein made by the coagulation cascade. 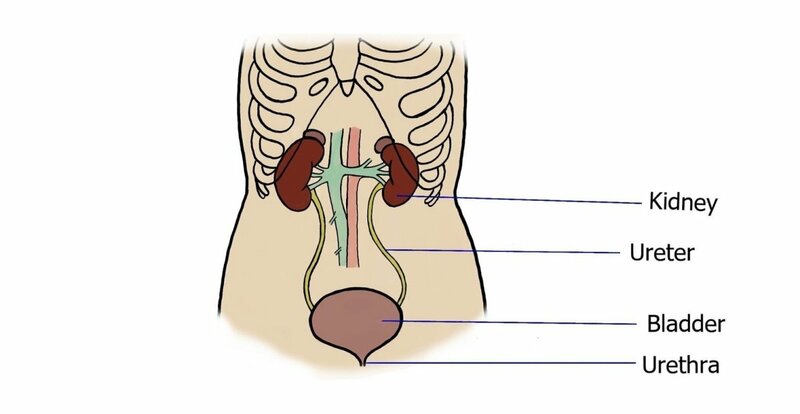 What are two mechanisms by which blood clots are prevented from propagating back through the circulatory system from a wound? Once a blood clot has formed to stop bleeding and the wound has healed sufficiently, the body breaks the clot down. In some cases, however, the clot leaves the wounded area and travels through the bloodstream. The body normally prevents this from happening. The clot contains an enzyme called plasmin. The enzyme enters the clot as plasminogen, an inactive enzyme made by the liver and transported in the blood. The lining of the damaged vessels in the clot slowly releases tissue plasminogen activator. This changes plasminogen into plasmin, which breaks down the fibrin in the clot in a process known as fibrinolysis. Urokinase plasminogen activator and some additional chemicals also activate plasminogen. Is thromboplastin involved in blood clotting? Yes, as shown in the table in the article and the picture illustrating a summary of hemostasis, thromboplastin is involved in blood clotting. It's an important factor in the process. What role does vitamin K play in clotting ? Vitamin K is essential for the blood clotting process because it’s required for the action of clotting or coagulation factors ll (prothrombin), Vll, IX, and X. It’s also required for the action of the anticoagulation proteins C, S, and Z. Is prothrombin a coagulation factor? Yes, as I show in the table, prothrombin is also known as coagulation factor ll (the Roman numeral for 2). It's converted into thrombin, which in turn converts fibrinogen into fibrin. What is the role of factor Xlll? Thank you very much for such a kind comment! I appreciate the fact that you’ve shared the article, too. TQ so much Linda for such an informative & comprehensive article on Blood Clotting Mechanism which transcends not just High School Biology, but also Pre-U and even Uni level Cell Biology or Biochemistry !! I found your article after my student asked me a probing question, "Is thrombin an enzyme ?" I answered it should be since it breaks up fibrinogen to fibrin, but I needed to confirm as we were never outright told at high school level that it is an enzyme. I did remark that they (prothrombin, thrombin, fibrinogen & fibrin) are all proteins. Factor V is encoded by the F5 gene. It’s produced in an inactive form and enters the plasma. Factor Vlll is encoded by the F8 gene, produced in an inactive form, and then sent into the plasma. Both factors are changed into their active form by thrombin. 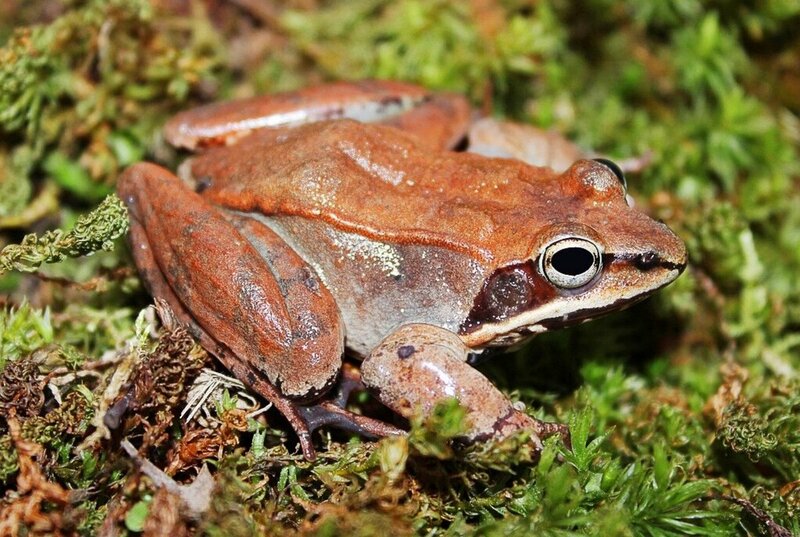 Researchers have found that they can also be activated by active Factor X. They may be activated by other substances as well. Research is ongoing. I'm sorry about your mother's situation, Jaishree. I hope she recovers well from her problems. I can't speculate about what may be wrong with her blood because I'm a science writer, not a health professional. Doctors that are familiar with your mother's medical condition need to answer your question. Hello Linda, my Mom recently did heart surgery but has had two incidences of bleeding and clotting around her heart. The surgeons went back in, removed the clots and dried up the blood but we are worried that this may occur again as it has already happened twice. They now suspect that something may be wrong with her blood. Can you offer some insight as to what may be wrong? Thanks for your urgent reply. Thank you very much, Mages. Thank you for simplifying it. Hi, Ram. Platelet donations are used in the treatment of some diseases, so in this sense people can use platelets that come from an external source, or another person. Can we use external platelets? Thank you so much!! God bless you!! Thank you very much for the comment, Fahana. Very easy to understand that blood clotting procedure!!! Thank you so much. Hi, Shannon. I don't know of any specific sites, but when I searched for "concentration of thrombin needed for hemostasis" I found some websites with numerical data that may be helpful for you. Hi, I found this really informative. Im trying to find out more about thrombin, and if there is an optimal concentration to achieve haemostasis. I am currently comparing some products that are widely used in surgery. Are there any sites that you could direct me to? Thank you very much for the kind comment, mariya. most helpful article ever! thankyou so much!! Thanks, hania. I appreciate your comment. Thank you very much for the comment, Vellur. I appreciate your visit and vote. Blood clotting is an amazing process and you have explained it so clearly. Interesting and informative article, voted up. Thank you very much, mehwish. Thank you, charity sekyi. I'm glad the article was helpful for you. Thank you very much for the comment, Porschia. Thank you very much, Sheri Faye! Now that was interesting and well written! Thank you! Thank you very much for the visit and the comment, ryanjhoe! This article is very helpful for me to get the information about blood clot and I never really understand about it before. Thanks for sharing this! Thank you very much for the comment, Dianna. I appreciate your visit, as always! Your posts are always a great read. Again, your detailed photos, charts and research makes an excellent article. Thanks for the interesting education of blood clots. Thank you very much, drbj! I appreciate the comment!! Thanks for the visit and the comment, Deb. Our bodies are definitely amazing! Our body really does do a lot of amazing things. Thanks for the great explanation on clotting. Thank you very much for the comment, Vicki. I think the problem with the quiz appearing is probably because you were using an iPad to read the hub. I'll have to see if the quiz appears on my iPad! Hi Alicia, a really interesting Hub, made very understandable and user friendly with your diagrams and pictures. Quality. Couldn't get your quiz though, maybe because I am on myiPad ? Thank you so much for the lovely comment, Austinstar. I hope that zombie apocalypse never arrives! You could definitely write technical books for medical students and nurses! Great job! We need to save your hubs in case of the zombie apocalypse. Thank you, Bill. I appreciate the comment very much! You do such a great job with these medical hubs. They are so detailed and yet you make them easy to understand. Great job and thank you for the information.